Required by building code in many areas of the country, self-adhering ice and watershields are available in several styles. RoofAquaGuard MT was designed to meet the widest variety of situations. It has a non-asphaltic top surface which can act as a slip sheet without having oils leech through. The top surface is also non-granulated so that it will not cause dangerous scratches or abrasions on the back of metal roof panels. The split release paper backer allows for the product to be properly positioned on the roof prior to full attachment. RoofAquaGuard MT offers premium ice and watershield performance and installer-friendliness at a very reasonable price. High quality, high temperature, self-adhering ice and watershield product designed for asphalt shingles as well as metal roofing. Self seals around nails and provides protection for critical areas such as eaves, valleys, gables, flashings, dormers, and skylights. Excellent low temperature flexibility with adhesion down to 40°F. Roll Size 200 sq. 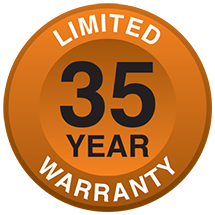 ft.
Our "best-in-class" limited 35 year warranty applies to all RoofAquaGuard underlayment products.